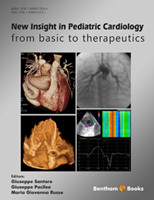 New Insight in Pediatric Cardiology: From Basic to therapeutics is a unique e-publication that deserves much attention. It encompasses many important chapters covering many aspects of CHD. The first chapter focuses on the genetics of congenital heart disease; the second on heart failure and cardiomyopathies; the 3rd on pulmonary hypertension; the 4th on newer echocardiography techniques; the 5th on MRI in congenital heart disease; the 6th on transcatheter treatment of children and adults with CHD; the 7th on the role of patent ductus arteriosus in CHD with duct dependent circulation and the final chapter on hybrid procedures in CHD. The editors have assembled well-known experts to write these chapters. There is no doubt that this eBook will be an important asset for those taking care of patients (children or adults) with CHD. Medical students, pediatric residents and nursing personnel will find this eBook very useful.